Ahhh summer. Perfect for straw beach bags and peach linen shorts that make me want to get some sherbet yogurt right now. Or some of the homemade peach ice cream I have in my freezer right now left over from our Memorial Day festivities at Amy’s house. I’m obsessed with this white cotton top because it covers the less than flattering parts of my arms – I’m not Kelly Ripa. What happened with Kelly and Michael Strahan anyway? *Tear* I was watching the episode where he announced his departure and my jaw dropped. I miss him already! Anyway, back to this top…. 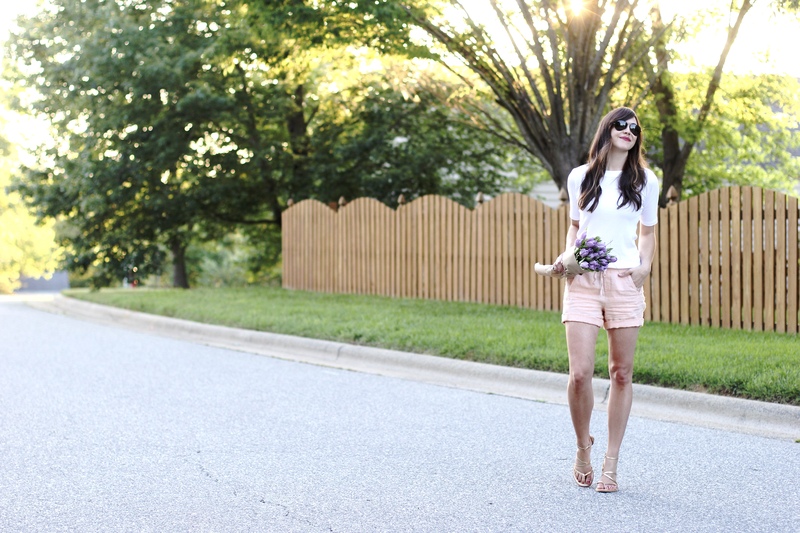 I’ve been pairing it with everything from these peach linen shorts to jeans and it’s now my “go-to” white top. I have it in black too 🙂 You know it’s a good thing when you have something in 2 colors. This beach tote was also perfect for our anniversary trip to Emerald Isle last month and I love the large size and colorful stripes. It’s also really structured which I think is a must for a good beach bag. I wish I were going to the beach soon! The next big trip I have planned is down to Jackson, Mississippi for Lindsey Brown’s wedding in a few weekends 🙂 She and I worked at MTV in Santa Monica together and lived in an apartment the size of your guest bathroom for a summer in college. Those were the days! We used to walk to the Santa Monica Pier and ride the ferris wheel and I tried to surf a handfull of times. I still remember how bad it would hurt when I face planted in the water, which was ice cold might I add… ouch. Lesson learned: stay on the beach, preferably with a cute beach bag. Hope you are having a good SHORT week and thank you so much for reading!